Welcome to the DSF Summer Surf Fishing Slam Series, a free to fish tournament we are hosting for the entire summer. You can’t do surf fishing tourneys in the summer, the beaches are just too crowded, which makes it logistically impossible. So we came up with the Summer Surf Fishing Series Slam. The T-shirt depicts how chaotic the beaches can be for people to try and actually fish, we may have had a little fun with that. 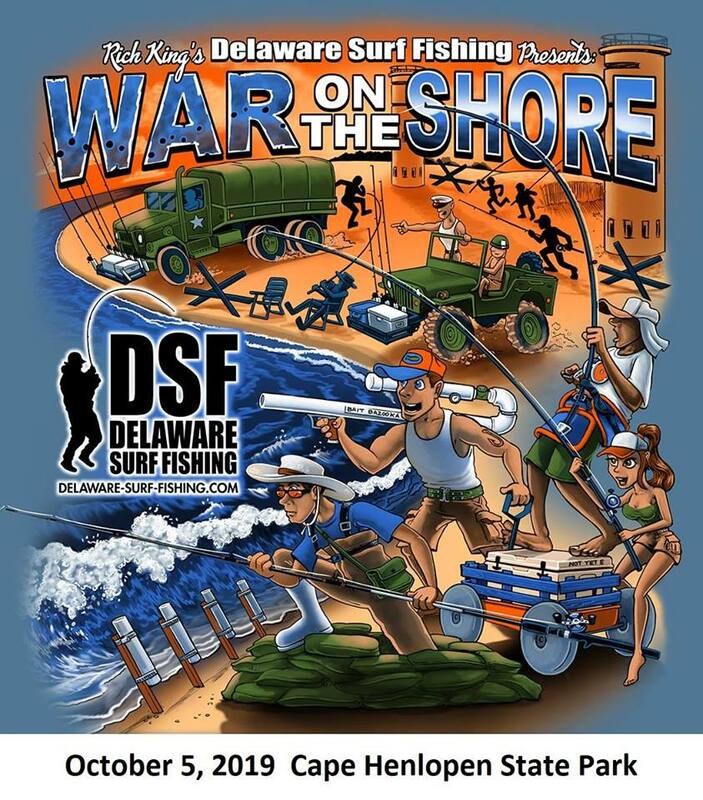 The DSF Summer Surf Fishing Slam Series is a free tournament to fish, for any and all surf anglers from Broadkill Beach to Fenwick Island. This includes the bay beach at Cape Henlopen State Park Fishing pier, no pier fish count. There isn’t an age limit. You don’t have to be on a drive on beach. Fishing times are from 7 AM to 7 PM. Anglers take pictures of their catches with the Delaware State fishing ruler, with a time and date stamp. Also there will be a playing card announced that day, it has to be in the picture as well. For example the card for that day might be a Jack of hearts, decks of cards cost about a dollar. Simple to do and simple to fish. Anglers can place from first to twentieth place. Prizes are gift card(s) donated by the businesses sponsoring the tournament. There are 11 chances to fish the DSF Summer Surf Fishing Slam Series, all summer long. Fishing time is 7 AM to 7 PM. Grand Finale … This will be a cumulative award. Anglers who fished in more than one of the series will have their points added up and the twenty with the most points will place in the grand finale. These will be higher end prizes to be announced soon. Awards ceremonies will be held on the following Sunday at sponsor locations central to the route 1 and Long Neck area. We will meet for a couple hours hand out prizes, you do not have to be present to claim your prize, we can mail these as well. There isn’t a calcutta, but we may do something for any unique catches. Scoring fish is simple, we will round down your inches for points. A twelve and a half inch fish is twelve points. We are not doing an extra point for live release, since there aren’t judges present to witness a release. For the bigger fish in the spring, like those monster bluefish we hope to see again. Measuring fish will be done with a seamstress tape or tape measure. We will have a video soon for a how to on that and pictures. NO STRIPED BASS will be in the fish list. 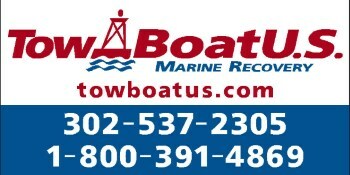 We are not going to promote catching and possibly killing striped bass in any tournament going forward in 2019. That fishery is having serious issues due to overfishing. We feel it is irresponsible to include striped bass or any fish that is experiencing a population decline due to overfishing. Fish and size limits for the DSF Summer Surf Fishing Slam Series. We have included fish normally not in tournaments. ​Skates, dogfish and sharks are not eligible to score. Fish must be at least the following lengths to be scored. We have the right to refuse any entries for discrepancies. Anglers are asked to only use 2 poles per angler, which in the summer is nearly impossible to use one anyway. ALL FISH MUST BE CAUGHT IN THE SURF. From Broadkill beach to Fenwick Island. All picture entries must have the day’s playing card in the picture and a state ruler available at any bait and tackle shop, or through DNREC. Anglers will email their pictures to DSF and we will post them on the tournament update page. Registration and T-Shirts will be available soon. We are looking forward to this tournament for the summer. 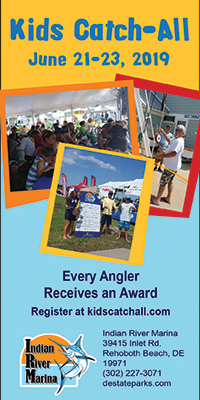 Earn braggin rights and fun prizes, while you are out there fishing the surf this summer. 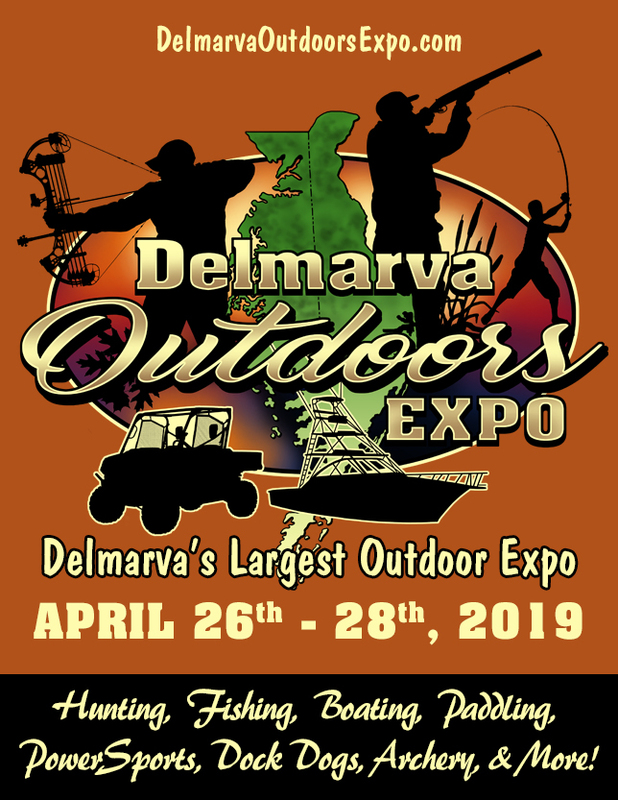 If you are interested in being a sponsor, email us at admin@delaware-surf-fishing.com. We have limited space available.